In line with decisions taken at the 2007 International Assembly on Independent Publishers in Paris, the language network Coordinators and the Board of the Alliance have been meeting on an annual basis since 2009 (please see our November 2009 Communiqué). 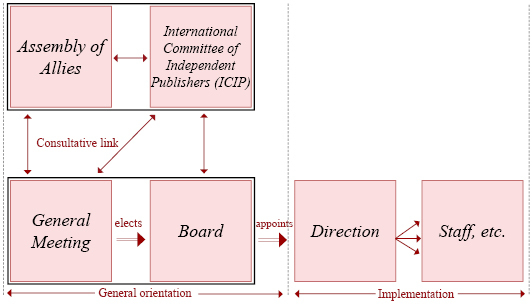 On 11 October 2010, the Coordinators and the Board of the Alliance met in Paris and decided jointly to create “The International Committee of Independent Publishers” (ICIP) [...]. Because the publisher members – Allies – are the primary players in the Alliance, the members of the ICIP and the Board of the Alliance are submitting the creation of the International Committee of Independent Publishers (ICIP) to your approval. On Monday, 12 October 2009, the Alliance met with its 5 linguistic networks coordinators and 6 committee members. This meeting, organised by the permanent task team, provided the opportunity to tackle various topics of vital importance to our initiative. The full report – including the minutes of this long and exciting day of work– was sent in French to participants. The latter nevertheless requested that a communiqué detailing the main issues discussed and decisions taken collectively be compiled in the three working languages, for distribution to all members of the Alliance. To facilitate communication between the Alliance’s language networks, set up as “one of the Alliance’s working practices” pursuant to a decision adopted in Dakar, each language network has a coordinator (elected by its particular members). The role of these coordinators is : to check that their network members and the Paris team members receive all relevant information ; to liaise with the Paris team ; to monitor the progress of projects that the network wants to carry out (co-publishing, sharing of expertise) ; to examine and give an opinion on applications to join their network and to liaise with the Paris team to organise network meetings. The language network coordinators have been members of the International Committee of Independent Publishers (ICIP) since March 2011. * Hamid Mehdipour, Germany/Iran (Forough Publications), coordinator of the Persian-language network. Publishing in Persian language : what book trade in Iran ? To read, an article published by ActuaLitté on 20 April 2015 on the study Publishing in Persian language. Read here the article published January 9, 2015 on the blog 2709 books : “From decolonization of minds to ownership of copyright” (“De la descolonización de las mentes a la apropiación de los derechos de autor”). Read the article “Bibliodiversity, digital publishing and readers” (« Bibliodiversidad, edición digital y lectores »), published on the blog 2709 books, on 12 February 2015. An article published on December 8, 2014 in “Le Populaire”, a weekly news published in Guinea Conakry, in the monthly column of Marie Paule Huet, literary director of the éditions Ganndal. Read the article on page 7 ! In the November 29th-30th issue, Le Soleil, Senegalese daily newspaper, share the press release that have been collectively signed in Dakar on November 25th, by the International Association of French-speaking Booksellers (Association internationale des libraires francophones) ; Afrilivres (Association of African French-speaking publishers), and the International Alliance of independent publishers. In this release, the professional collectives state “their solid will to work together to promote books, reading, and access to the book”. The Cape Town meeting (International Assembly of Independent publishers 2014) on the Tunisian cultural radio ! Listen to the interview of Nouri ABID (Med Ali in Tunisia and coordinator of the Arabic-speaking network of the Alliance) on the Tunisian cultural radio, on September 3, 2014. Livres Hebdo, April 25, 2014 relays workshop on digital publishing in the Arab-speaking world (April 30-May 3, 2014), organized in partnership with the Abu Dhabi International Book Fair. More information about the workshop here. « Mes étoiles noires » by Lilian THURAM on TV5 and RFI ! Listen here the interview from Lilian THURAM on TV5 on Tuesday 9 April 2014 ! And here the interview on RFI (emission “Radio Foot”) on Monday 14 April 2014 ! Read the post of Mariette ROBBES in the blog of “PaperTigers”, May 20th, 2013. Publishing in Persian language presents a comprehensive and current overview of publishing in Persian language, in Iran, Afghanistan, Tajikistan, Uzbekistan, but also in the diaspora in Europe and the United States. Articles, penned by Ali Amiri, Beytolah Biniaz, Masoud Hosseinipour, Farid Moradi, Laetitia Nanquette and Dilshad Rakhimov, enable an understanding of editorial markets through historical, economic, political and cultural perspectives. This study sheds light on the work and publishing list of several independent publishers in Persian language, and thus enabling professional and intercultural exchanges. Publishing in Persian language is available in Persian and English, and openly accessible on the Website of the International Alliance of Independent Publishers, in PDF, ePub and MOBI formats. Publishing in Persian language, “État des lieux de l’édition” collection (Reports on the publishing world), International Alliance of independent publishers, 2015. Publishing in Persian language was made possible through the support of the Prince Claus Fund. We thank all contributors, publishers, and professionals who participated to this collective endeavour –and particularly Sonbol Bahmanyar for the coordination of the study. “Translation and Globalization”, the new issue of Bibliodiversity ! Edited by Gisèle Sapiro, the number 3 (February 2014) of the journal Bibliodiversity is available ! Extract from the introduction, by Gisèle Sapiro. Read other issues of Bibliodiversity here. The “Young Talents” collection, dedicated to the best Masters dissertations in the « Book Trade » adds another title to its list ! Mariette ROBBES, who conducted some field work for her research, offers a fascinating analysis of youth Indian publishing. On the contrary of other Asian publishing market, like Korea or Japan, the Indian book market is nearly unknown by French children’s book publishers, thought this industry is actually blooming. The Indian book market is a very specific one : the country’s size makes book distribution difficult, many languages are spoken and written, and there is a wide gap between urban reading habits and rural ones. Independent publishers in this country adapt business strategies to these difficulties and the solution they find are really original. As the lack of studies and data about Indian publishing is quite strong, this study is based on a certain number of interviews with booksellers, book fair directors, market specialist, illustrators, distributors and publishers. An exciting memory on a subject unexplored... to read now ! « The digital South », the newly-released issue of Bibliodiversity ! With digital publishing under close scrutiny, Bibliodiversity naturally felt it was important to offer a different angle on the subject, highlighting a less familiar aspect of the current situation. In accordance with our editorial line, and in keeping with the research undertaken by the journal’s partners, it seemed vital to give a platform to voices that are seldom heard and rarely listened to. This issue, which focuses on e-publishing in developing countries, is supported by the Prince Claus Fund. Click here to read other issues of the review. here the Epub format ! The team of the Alliance welcomes you to 38, rue Saint-Sabin (11e), from Monday to Friday, from 10 am till 6:30 pm. Who are the new digital players in Latin America, Sub-Saharan Africa, the Arab world and in Russia, China and India ? Can digital publishing develop autonomously in the emerging economies, independently from the rich countries ? What support policies are required to stimulate the growth of this new industry and help the traditional publishing sector adapt to the changes ? Based on interviews, questionnaires and meetings, Octavio Kulesz provides an overview of digital publishing in these 6 regions and puts forward concrete proposals aimed at independent publishers. Digital publishing experience in the South offers an insight into the major opportunity the new technologies represent for developing countries — especially when it comes to distribution — as long as local entrepreneurs seek innovative models suited to the concrete needs of their communities. The creation of « Bibliodiversity – Publishing and Globalisation » rests on three preliminary acknowledgments. The notion of bibliodiversity, despite its rapid spread and significant potential, remains scantly explored, insufficiently discussed, poorly grasped, and even misused – reduced at times to a simple slogan. It was important to save the notion from becoming even more depleted. Furthermore, the two co-publishers – the International Alliance of Independent Publishers along with Double Ponctuation – wish to contribute to original research, the development of intellectual and functional tools, and the collection of testimony that could help us understand the changes occurring in the world of books and publishing. Finally, there is not yet much space available in which to study these changing phenomena with a perspective that is simultaneously international, intercultural, and interdisciplinary. Nota bene : Bibliodiversity is not an Internet site ; it remains first and foremost a linear publication and is organized, dated, and signed. As a service to the journal, the site will maintain its minimalist approach ; there are no plans to use the site to replace the journal. Download the format epub ! Download the Press Release - to distribute widely ! In the last 15 years, the digital revolution has modified the way cultural goods are produced and distributed. Music has probably been the first industry concerned, but the impact has now reached other areas, in particular the book sector. Indeed, ebooks, audiobooks, print on demand, online stores and the expansion of mobile phones have deeply transformed the traditional publishing landscape. Nevertheless, given the serious infrastructure limitations existing in the developing countries, it becomes crucial to assess the impact that technology is having on the publishing industry in those regions. Which e-publishing companies are flourishing today in the Southern countries ? Which policies could be implemented so as to foster this new industry as well as to help the traditional actors to adapt to the changes that are currently taking place ? In order to explore these topics, the International Alliance of independent Publishers in partnership with the Prince Claus Fund, has launched an in-depth study, co-ordinated by Octavio Kulesz, director of Teseo and member of Digital minds Network. The first stage of the research consists of a number of interviews with different actors from the book sector, so as to understand the current situation as well as to propose global initiatives. Every actor from the publishing sector (especially publishers and booksellers) are invited to share their views and experiences through this brief questionnaire - click here ! Massively used by small publishing firms to distribute their products to bookstores, libraries and readers, the postal service is the most popular means of circulating books throughout the world. However, the absence, suppression or questioning of special postage for books is an impediment to bibliodiversity in many countries. In Latin America, with the huge territory to cover and limited circulation, a large share of publishers ensures the delivery of their products themselves. For these publishers, preferential postage rates for shipping books are all the more vital.